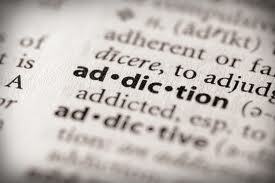 Thomas is an experienced and accredited counsellor in private practice. Her practice is based in rented accommodation just outside a small town. She is a female-identified trans therapist who works as Thomas but sometimes prefers to dress and live as a woman. She has not been through any reassignment surgery or hormone treatment. Thomas has been seeing a client, Angela, for around a year, and they have worked on deep and sensitive issues that Angela is just beginning to resolve. Some of these issues are around anxiety. Last week, Angela told Thomas that she is going to move to an area very near to where Thomas lives, as she is starting a new job. Thomas is concerned about self-disclosure should she run into Angela in the neighbourhood while wearing female clothes. What are the ethical issues in this scenario and what should Thomas do? As we emailed back and forth, we were fairly concerned about the way the dilemma was framed, and whether and how we should respond to this. We were concerned with how genuine it was, the pronouns, and even where to begin answering something so politically and legally sensitive in 500 words. This was even more prescient, since a colleague had recently taken to an Employment Tribunal an organisation which had refused to continue to send her clients once she transitioned. My colleague won her case, but it was highly stressful and this was a sensitive issue. Within Pink Therapy, I was the only therapist to reply to the dilemma and I had grave misgivings about doing so but I felt it was more important to say something than leave it unanswered. Counselling as a profession is woefully ignorant around diversity and equality issues – especially with regard to gender and sexual diversity, I know this, because I’ve spent the past 30+ years trying to raise this awareness and I’m still constantly hearing examples of poor practice and fewer examples of good practice. One of the other respondents (Alex) is a highly experienced transgender therapist who shall we say, knows a thing or two about this kind of dilemma. This month’s dilemma Thomas is an experienced and accredited counsellor in private practice, working in rented accommodation just outside a small town. He is a female identified trans therapist who works as Thomas but has times when he prefers to dress and live as a woman. He has not been through any reassignment surgery or hormone treatment.Thomas has been working with a client, Angela, for about a year, and they have worked on deep and sensitive issues that she is just beginning to resolve. Some of these issues are around anxiety.Last week, Angela told Thomas that she is going to move to an area very near to where Thomas lives as she is starting a new job. Thomas is concerned about the kind of self-disclosure that this might entail should he run into Angela in female clothes. Although heavily disguised, this is a dilemma sent in by a reader who specifically asked to be addressed using the male pronoun. The wording in this dilemma has been revised since its publication in April’s issue of Therapy Today, in the light of feedback from contributors. Opinions expressed in the responses are those of the writers and not necessarily those of the column editor or BACP. This case is very problematic and sensitive. It raises many points that could be made and I’m going to address just a few of them here. My initial reading of the dilemma, as originally presented in the April issue of Therapy Today, caused me considerable concern over the language used and the way the dilemma was framed. Thomas’s gender identity became a noun, ‘Thomas is a transgender’, which immediately set my guard up. This has since been amended. Thomas is ‘a transgender person’, or Thomas is ‘transgender’. However the pronouns used are entirely male, and we are not given Thomas’s preferred female name. As Thomas’s preferred identification appears to be female, this feels as if her identity is being denied. One of the first things one learns when working with someone who is gender variant or where their gender is ambiguous is to enquire how they would prefer to be referred to and, if they are clearly presenting as the other gender, to use pronouns relevant to the gender presented. The dilemma also appears to make an implicit assumption that to be a ‘real’ trans person one should undergo hormone treatment or surgery or both. It should be born in mind that this is not possible or desirable for many trans people. How Thomas chooses to live her life is her own business and she is afforded some protection under the law in the Single Equality Act 2010 and the Human Rights Act. As a therapist, Thomas will want to be mindful of the principles in the BACP Ethical Frameworkand, while many colleagues (including, perhaps, Thomas) might consider non-maleficence as the core principle, I’m also aware that there are other principles to balance out here. We should not assume that the client is too vulnerable to be able to manage this information as that denies Angela’s own autonomy and the chance to grow and learn and demonstrate her own compassion and so autonomy is worth Thomas’s consideration. Not to disclose to Angela is perhaps doing her and their therapeutic relationship a great disservice. As Thomas is being mindful of their personal boundaries and psychological health, the principle of self-respect is relevant. Exploring the situation in supervision and planning how to share this information, especially if Thomas is considering a full-time transition to a female or more explicitly transgender role, is also important. I think most therapists have experience of dual relationships and the possibility of meeting my own clients in social settings is something of which I’m always mindful. I think this is best dealt with at the beginning of the relationship, by agreeing how we will manage any outside contact. In this case, I think it is relevant for Thomas and Angela to discuss briefly how it might be for Angela if she were to meet Thomas en femme in the neighbourhood. It strikes me that ‘Thomas’ (and we don’t have her female name here) is in the early stages of her transition. It is understandable for her to feel highly anxious about the process of transition, yet we know from the experience of other trans therapists that it can be more straightforward than she might imagine. First, medical intervention (surgery and hormones are mentioned) is not a requirement for protection in law from discrimination, and it would be prudent for Thomas and other therapists to become fully acquainted with the Single Equality Act 2010, since there is an ethical principle of justice here. Second, it is important that we don’t infantilise our clients – or collude with prejudiced views under the guise of ‘protecting the vulnerable’. This was the argument Richard Littlejohn inappropriately used in the Lucy Meadows case and we know the tragic outcome there. If a client is homophobic or transphobic, then a positive experience of interacting with an LGBT therapist can serve the greater good: prejudice is borne of unfamiliarity so we serve an ethic of beneficence towards both client and society. While clients retain the ethic of autonomy to act out on their prejudice (and that could equally be because they perceive the therapist as too young/old, too middle-class, too culturally different), we should not as a profession be guilty of the same. 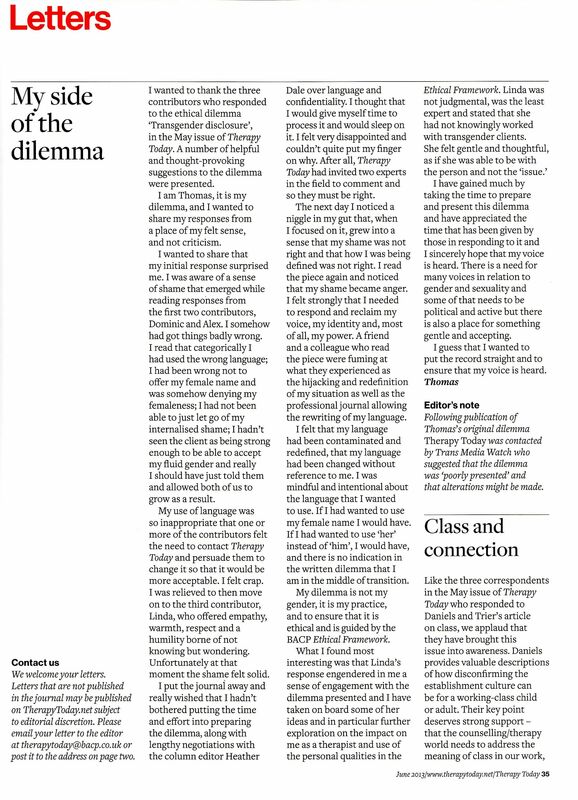 My suggestion, given that Thomas is currently living a dual-role identity, is that she lets go of the internalised shame and embraces a congruent trans identity: upfront in a straightforward, matter-of-fact manner. Simply saying to the client, ‘Coincidentally, I’m transgender and, although you’ll read me as male, I identify as female so when I’m not working I present as female,’ can be included in the generic ‘If you meet me in Tesco’s’ conversation that we may have in initial contracting. It would benefit Thomas to network with other transgender counsellors and psychotherapists to gain support and insight into best practice, to serve the ethic of self-care, and in the greater good of the profession. Counsellors are great at talking the talk – I’d say it serves the ethic of fidelity in the profession when therapists can actually show they walk the walk too. The possibility of meeting clients outside of the counselling room is something most of us will have considered at some stage, probably during our training. What if we see a client on the street or in the supermarket? Do we acknowledge them or not, and if we do, will that make our professional relationship obvious to people they’re with? What if we see aspects of their lives we didn’t know about and what if they see aspects of our lives that we haven’t disclosed? It would be a normal part of the contracting process to discuss some of the ‘what ifs’, especially for a counsellor working in a local community, such as ‘Do we say hello or not?’. So I hope that Thomas would already have considered, perhaps with his supervisor, the possibility of meeting his clients outside of work. However, we don’t know if Thomas’s supervisor is aware of his transgender identity, or if Thomas is prepared to share that. Working with transgender clients or colleagues is not something I knowingly have experience of. I certainly would encourage Thomas to talk this through with a supervisor who has expertise in this area. This is not only a boundary issue that might affect his relationship with Angela and impact on her anxiety; it may happen with other clients. If unresolved, Thomas’s concern could become anxiety, impair his own wellbeing and impair the quality of care he is able to provide. Thomas may be completely at ease with his transgender identity. However the dilemma may be compounded by the often-held stigma about and misunderstanding of transgender issues. Thomas and Angela have probably built up a high level of trust over the year. If Thomas doesn’t disclose now and waits until he bumps into Angela, might she feel betrayed by his secrecy, or confused? Might she feel indifferent, accepting or rejecting? Might it impact on her wellbeing? Thomas needs to guard against making any assumptions about Angela’s reactions. And from Thomas’s perspective, while being transgender is part of his identity, he may resent the idea of having to share it, and possibly feel forced by circumstances. Has he felt compelled to keep it secret at work and also in his wider life, or has he made a considered choice of privacy? It may be something he’s already explored. If not, he may find it useful to do so with a suitably trained counsellor who has a sexually affirmative stance. If he considers the personal qualities of the therapist to which the BACP Ethical Frameworkencourages us to aspire, this may provide rich ground for his thinking: empathy, sincerity, integrity, resilience, respect, humility, competence, fairness, wisdom and courage. What would each of these mean in relation to this situation? When Thomas has considered all of these and other aspects, ideally in supervision, I think he will be in a better position to decide what to do. I guess I was a bit surprised, when this month, there was an extensive letter from the writer of the original dilemma expressing their hurt and anger at me and Alex for our responses. Trans* issues raise all sorts of sensitivities. I know that many cis-gendered people like myself, can feel very unsure when commenting on trans* issues for all sorts of reasons and so a debate or discussion is sometimes quite difficult to have. Earlier this year there was a huge and justificable outcry and outrage at Suzanne Moore’s piece for New Statesman especially when it was followed up with a vitriolic defense by Julie Birchall in The Observer (quickly taken down, but still available online. Trans* people are often maligned in the press and the work of Trans Media Watch has been doing a great job at trying to to monitor and respond to transphobia and improve the state of reporting of trans issues and increase understanding. I think I will just need to hold onto myself, calm myself down and realise that we live in a period of history where its very easy to offend people or not get it right and one persons’s feelings do not trump another’s. Both views can be equally valid. Most within the LGBT+ community will be aware of Russia’s growing presence in the news stream for anti-gay political action. The most recent piece of news, reported here on the 11th of June by the BBC, has been the passing of ban on anti-gay propaganda. The video also reports on the anti-gay sentiment still apparent and even encourage in Russia today. In light of which, PT offers a reminder that some of our resources are available in Russian. This is in the hope that these will be available to Russian people affected by the ban and to remind them that what is being promoted by the Russian government is unjustified and cruel, and no reflection on them. 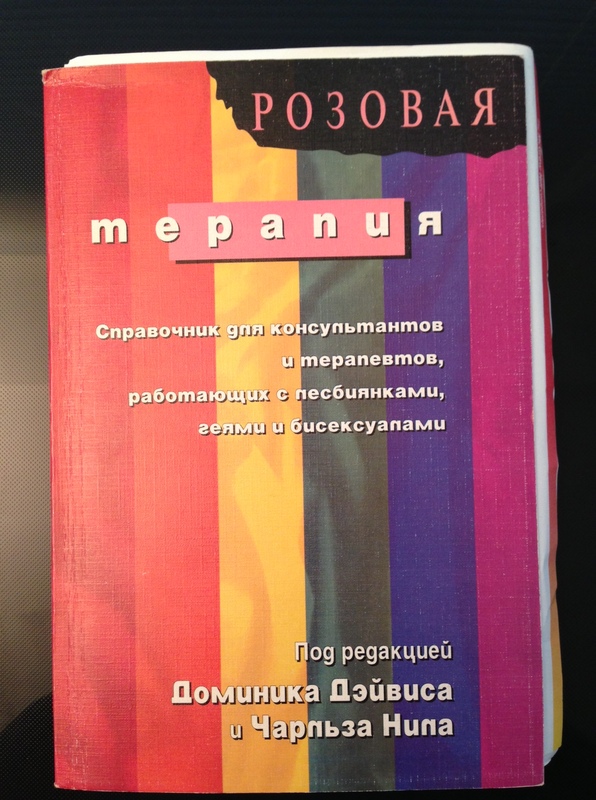 Link to the Language Project at Pink Therapy where we have a paper summarising our recent thinking on Gender and Sexual Diversity Therapy in Russian (and other languages). We welcome further translators to join the project!